The wait is over Angry Birds fans: Rovio has officially launched Angry Birds Space for the iPhone, iPod Touch, iPad, Android, Mac, and Windows. The new Angry Birds game features 60 different levels, and, as usual with Angry Birds games, Rovio is promising regular updates with more free new levels. IOS users can also buy new levels via an in-app purchase, and players on all platforms can uncover several secret levels hidden in the game. 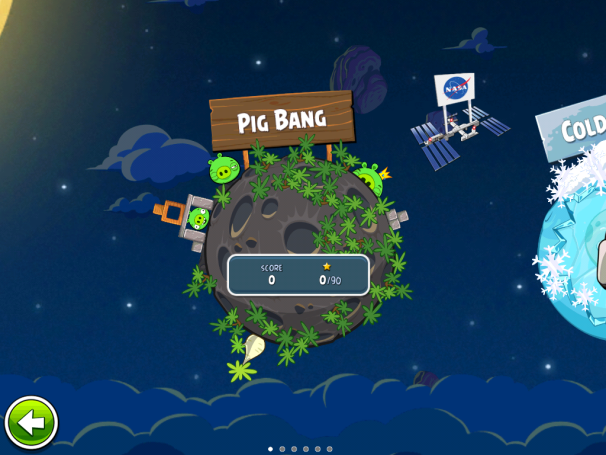 Angry Birds Space costs $0.99 for the iPhone, iPod Touch, $3 for the iPad , $5 on the Mac App Store, and Windows users can buy the game directly from Rovio for $6. There is also a free game demo for Windows if you want to try it out. Android smartphone users can download a free ad-supported version from Google Play. Rovio said it is also planning a non-ad supported version for Android phones for $0.99 as well as an HD version for Android tablets for $2.99. Owners of Apple's new Retina Display iPad will be glad to know that Angry Birds Space is optimized for the device's 2048-by-1536 resolution. If you have an original iPad, however, you might want to hold off on buying Angry Birds Space. In my tests on a first-generation iPad, the app continually crashed, requiring about four restarts before I could tap through to actual gameplay; the game continued to crash while playing. UPDATE: If you are experiencing constant crashes with Angry Birds Space on an older iPad, rebooting the device should fix the problem. The brief chance that I did get to try out the game, I found it to be a novel approach to the standard Angry Birds game. Some levels allow you to slingshot in either direction around a moon to get at those horrible green pigs, and you can manipulate the gravity of nearby space bodies for trick shots. Rovio says the game also has new characters and superpowers. Hopefully, I'll get to experience more of those new additions once the game becomes more stable on my iPad.